I’ve heard this rumor a lot over the years, and seen it mentioned online. But nobody seemed to know exactly where “Sweet Child O Mine” was filmed. I brought this up in a Huntington Park group I’m in on Facebook, and it generated some interesting conversation. Having grown up in HP I didn’t remember any ballroom there, but in the 80’s I left HP and was in film school (for a brief time) in Hollywood. After much discussion, including a dismissal of an article claiming Huntington Beach was the location of SCOM filming, the actual location was indeed a ballroom at 6130 Pacific Blvd, Huntington Park, CA 90255. Today, it is a 99 Cent store. The ballroom existed above the now 99 Cent store, and looks like it’s been closed off for quite some time. SCOM took an entire day and part of the night to film. The ballroom was known as Mendiolas, then La Rumba nightclub, which eventually closed due to health code violations. 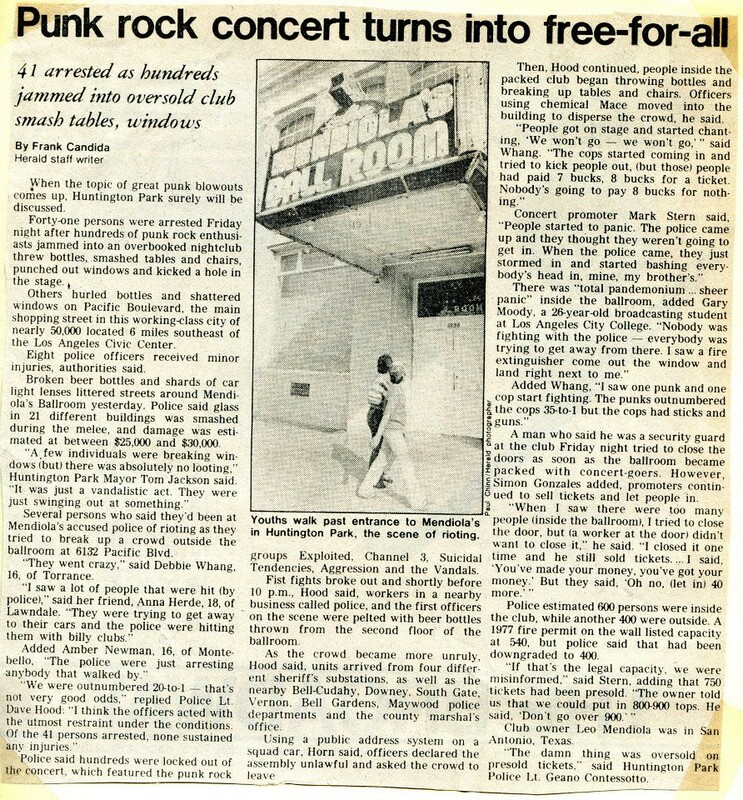 Supposedly Black Sabbath played there once in the 1970’s under an assumed name, but the so-called Punk Rock Riots, also known as the Exploited Riot made it infamous. I will have to take a trip down to HP and see if the 99 Cent store would let me check out the upstairs! Check this article out as well. Thanks to Letty Martinez, Sergio Ortiz, Jim Ramirez, Yvonne Felissa Salgado, and Alfred Valadez. I visited “The Last Bookstore” for the first time last week. It’s a great place with lots of character. It’s located in the Spring Arts Tower at 5th & Spring, and used to be a depression era bank. The vaults and heavy vault doors are still there, as well as the original tile floor. I of course asked one of the workers there if it was haunted. He replied that no one wants to venture up to he second floor at night before closing. Awesome. Shot from the second floor. My friends Sabrina and Gladys quickly found the strange and occult section of the bookstore on the creepy second floor. The book represents early research into the phenomenon of EVP(Electronic Voice Phenomenon). It’s written by the man who wrote the preface and edited Konstantīn Raudive’s Breakthrough. I found the introduction to “”Voices From The Tapes” very relevant to today’s paranormal investigators. But the coolest thing was the book was a gift to someone in 1977, and a small note was left at the beginning of the book. So my friend Lia wanted me to report on this book as I read it. I’m reading the book in pieces, as I rarely find time to read a book anymore! The entire book is only 160 pages, and could easily be finished in an evening. But I sometimes like to ‘live” with a book for a while, and think about what I’ve read. I may not get back to a book for a week or more. The book first takes us through scientific reaction to the EVP phenomena, and how serious it was taken and researched in the 1970’s. Batteries of tests are presented, trying to figure out just where the voices were coming from. By process of elimination, Bander states the voices were dismissed from coming from outer space, or a projection of our subconscious, also known as “thought forms.” The only “possibility” left were voices of the dead. The voices d indeed show up on oscilloscopes, even after every possibility was eliminated, including radio waves. Surprisingly, Bander’s book is openly critical of Konstantīn Raudive. The author chronicles the problems he had with the very demanding Raudive in getting “Breakthrough” ready for publication. Bander also states that some of Raudive’s conclusions were questionable, and he insisted that questionable material be present in his book. Bander states that “Breakthrough” is a difficult read, and it is. I’ve owned the bouk for about 3 years and still haven’t finished it. The book is basically meticulous notes of all the EVP Raudive captured, with side notes and minutiae that are just boring to read through. That’s it for now. Stay tuned for another update! Hallway to the 99 cent books. David Oman is opening his home up once again for two nights of séance and investigations for what is reportedly the last time. The séance and investigations begin at 8:00pm Friday night August 7th and ends at 3am August 8th. The next evening, Saturday August 8th will also be at 8:00pm and concludes at 3:00am. For tickets, a direct link is here. Check out the Facebook event page and let everyone know you’re coming; and coordinate with friends. Also, check out the public group for the Oman House Investigations, where last minute announcements are posted. Investigators are allowed to bring their own equipment to the Oman House, so take this opportunity to test your most reliable paranormal gear into a very active location. You’ll also have access to David Oman himself on both nights, where he will candidly answer any questions you may have. Check out David Oman’s Youtube page for some amazing video of incidents occurring at the Oman House.